The most fundamental geographic and cultural division in Scotland is between the Lowlands and the Highlands, as shown in the map. The lowlands are flatter and more fertile, the highlands steep, rocky, colder and less fertile. In the 16th to 19th centuries, the highlands were predominantly Gaelic whereas the lowlands were becoming more anglicised. Aberdeenshire is on the edge of the highlands, with a small portion around Ballater within them. The feudal system of the middle ages (which applied to much of Scotland) left much of the land ownership in the hands of clan chiefs or lairds. The clan system imposed obligations on the clan chief to care for and protect his tenants (who were also clan members), and on the tenants to pay rent and to fight on behalf of the chief. The ordinary farmers lived a hard life in often harsh conditions. Inter-clan warfare was common in the 15th and 16th centuries, and warfare with England common in the 17th and 18th centuries, ending with the Battle of Culloden in 1746, when the English soundly defeated the Scots. This was a critical date for the Scottish highlands and neighbouring areas including Aberdeenshire. 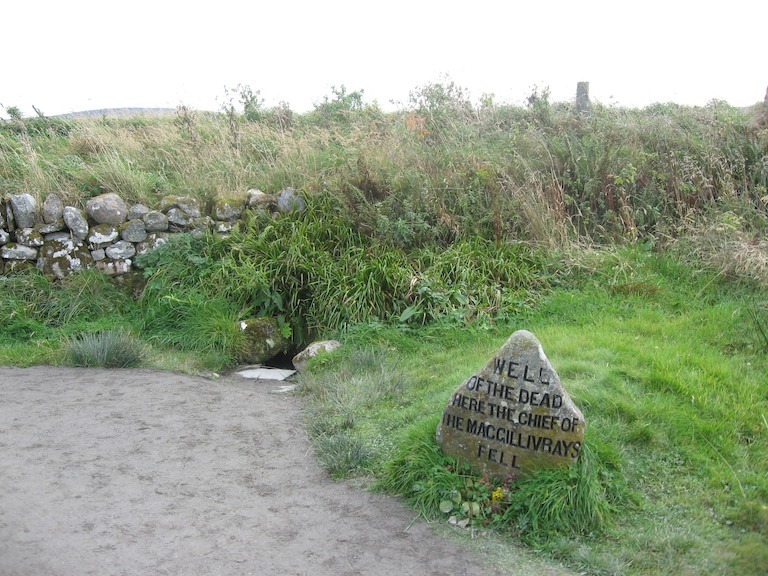 Well of the dead where one of the clan chiefs fell in the Battle of Culloden. Well before Culloden, the clan system was being suppressed by the English through various Acts of Parliament which broke the power of clan chiefs to call their tenants into military service, and which gave the lairds the power to ‘enclose’ the land that their tenants lived on, effectively taking it over. After Culloden, clan chiefs found it even more expedient to cooperate with the English, especially as agriculture was becoming more profitable due to new farming methods and the introduction of a breed of sheep which created much larger profits from grazing than cattle provided. Some started demanding payment for rents (which crofters often couldn’t afford) instead of labour as before. Some see it as inevitable progress, others as despicable betrayal of their clans, but from the late 18th century through to the mid 19th, many highland subsistence farmers were removed from their land, sometimes brutally and at short notice, to create pasture for sheep, which were more profitable than cattle and cropping. Thousands were forced to emigrate to the coast, to the larger urban centres, or overseas and many parishes were substantially depopulated. Aberdeenshire was on the edge of this. Some farmers were evicted but in most cases, the population remained. But land ownership remained in the hands of a relatively small number of gentry, while the rest of the rural population rented small farms (called crofts) or worked as labourers on land they didn’t own. In 1750 Aberdeenshire had a population of almost 120,000, with about 16,000 living in Aberdeen. Thus more than 85% of the population lived in rural areas, in 85 rural parishes with populations varying from about 300 to 3000. A century later (about 1850) the population was almost 200,000 – 42,000 families living in 32,000 homes. About a third of these were living in Aberdeen city. About a third of the land was under cultivation, mainly for oats, and sheep and cattle were grazed. Most of the rural population lived in small towns and farm hamlets. Tenant farmers leased land from the large landowner and then either farmed it themselves (often with the help of cottars or agricultural labourers), or rented it out in smaller lots to crofters and cottars. Crofters were farmers who rented small areas of land, often around 10-20 acres, in exchange for labour on the tenant farmer’s land. They subsisted on their small holdings, growing vegetables and having a few stock, with their income often augmented by a trade such as weaving or blacksmithing. Cottars were little different to crofters – indeed the terms were interchangeable in some locations. They were tenants of a smaller area of land which was generally barely enough for a single cow and a few vegetables, and laboured on the tenant farmer’s land. They too subsisted on their small holding, with their income often augmented by a trade. Agricultural labourers or farm servants had no land of their own and moved around often to find work on the larger estates or with tenant farmers. Often they married late, as it took some time to be able to rent a house and hope to become a crofter. Crofters’ and cottars’ wives and children often had to assist with farm work on their own small holding and the tenant farmers’ land. Restored farm cottage at Culloden, similar to crofts in Aberdeenshire. Up until about 1870, the majority of Jock and Annie’s ancestors lived and worked on farms. For example, in 1800, 3 ancestors lived in Aberdeen and 12 lived in rural areas, where most were farm labourers or small crofters. Some had trades as well – for example, George Moir (1713-1784) was a blacksmith. Where a farm was sub-divided into crofts, a small hamlet might form – e.g. Brainjohn and Badenscoth, where some ancestors lived. The average household was 5-6, but some were as large as 12 or more. In large families, some of the older children had moved out before the youngest were even born, and some children lived with relatives due to lack of space. Birthrates and infant mortality were both high, leading to an average life expectancy of only about 30 in the middle 18th century (though if you survived childhood, you might expect to live to 50 or 60), but increasing significantly in the 19th century. Many women didn’t marry, and the average age for first marriage was about 25. This website gives some more information and photos of a typical highland home on a farm. 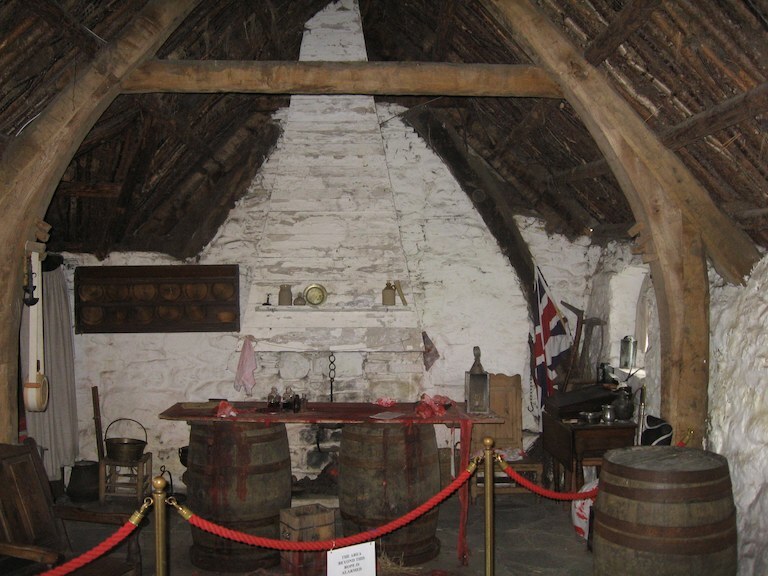 Inside the restored cottage at Culloden. During the Medieval period in Scotland, the lords of the manor owned large tracts of land, some of which they leased to peasant farmers. This land was held in common by all the peasants, using the ‘runrig’ system – long cultivated strips suitable for ploughing (rigs) separated by narrow uncultivated strips (runs). Each season each peasant would receive a new set of rigs, ensuring the best land was shared. Peasants also had access to large areas of common non-arable land, for grazing stock. It is estimated that in 1500, half of Scotland was common land. Runrig farming continued after the medieval period, with ownership of land mostly in the hands of lairds or heritors, and the tenants having more freedom to move around. However it was coming to an end by the end of the 18th century, as crofters leased specific portions of land and the common land was gradually acquired by the major landholders. Landowners thus gained greater control, for tenants could be turned off their land at any time. The biggest changes to land tenure in the highlands were the clearances (see above), where famers were forced off their rented land so the larger landholders could combine the land into larger pastures for sheep. The clearances had less of an impact in Aberdeenshire, and it was the ambition of most farm servants to lease their own croft. However increasing population made it hard for families to survive on the small crofts, and many moved to the city or even emigrated. In the late 19th century, after some civil disturbances including refusal to pay rent and taking over land by force, laws were passed to give crofters in the Highlands (8 counties) legal status and greater opportunities to expand or purchase their crofts. At the present time, consideration is being given to extending these laws to crofters in Aberdeenshire – though by now few of these are subsistence farmers, and are more likely to be hobby farmers or rural residents. For much of the 16th to 19th centuries, the church was one of the most important social institutions. Churches kept the only consistent records of births, marriages and deaths, and maintained funds (which the lairds had to contribute to) to alleviate the worst poverty and misfortune. The ministers were some of the most educated people in rural areas, and their description of their parishes, the geography, population, land use and wealth, collected in several Statistical Accounts provide some of the best information of this period. The Church of Scotland, which was Presbyterian. Independent churches which seceded from the Church of Scotland in the late 18th century. This outline of life in Banffshire, just north of Aberdeenshire, is very comprehensive. Hi Eric – thank you for linking to my article about farm servant life. Your account is fascinating, and very well researched. Looking forward to reading more on your web site. Hi Judy, I found your article every bit as helpful as you apparently found mine, and used it to confirm several details. So thanks for your kind comments and for the help your article offered. I am looking for the name of an estate belonging to a George Forbes who served as a juror on the Justiciary Court for the Northern Circuit in 1772. It looks like Ledmaeay. Do you know of it? No, I’m sorry, Helen, I can’t help you. But try a local history group, maybe Fyvie Heritage or a Scottish genealogy forum, I’ve generally found I get answers that way. Hi Eric. Very interesting. I have been researching my family the Beaton’s. They where in the Aberdeen area. Methlick and fyvie mostly. I know one of the ancestors James beaton owned a farm called Darnabo. My husband and I visited it 2 years ago. Very exciting for us. Would you have any information on that family? I would be really interested in anything you have to offer. Thanks again for your article. I found it very interesting. Jacqueline Beaton. Sorry to delay in replying, but I have had a busy weekend, attending and organising a large family celebration. I’m sorry but I have no information on the Beaton family or on the farm Darnado. It seems that many of these farmers owned or rented small crofts or farms (e.g. this one that was close to 15 acres), so there are very many of them. I visited Scotland once about 9 years ago, and spent a short time in Aberdeen, but I didn’t know much family history then, so I didn’t know the interesting places to visit. I would like to visit Fyvie, Methlick, Tarves and Ballater. When I was searching for information about ancestors buried at Fyvie, and the name of a small farm near Fyvie, I found the Talking Scots forum and the Fyvie historical society were very helpful. You may find the same. Since you and my wife both have ancestors from the Fyvie area, it is probable that if we were able to trace back far enough there would be a connection, but I don’t know of one. All the best for your search. Hi Margaret, thanks for your positive comments. I feel a little remiss that I didn’t list all my sources. Some of the main links are in the page (e.g. the Statistical Accounts, which I used where I could), but there were certainly others. Most of the other information came from careful searching on Google, and I wish I had kept a copy of all the references. 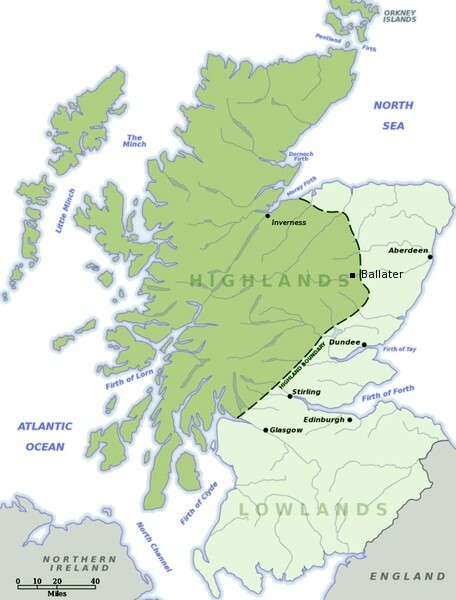 Highland Clearances in Wikipedia and Britannica. I also read a history book on the Highland Clearances, but I can’t remember the name now. Aberdeenshire and Aberdeenshire (historic) in Wikipedia. I also remember looking up many references on crofting, the feudal system and the meaning of words like cottar, tacksman, etc, but I’m sorry I don’t have these references now. It was really slack of me. Hello Eric, thank for your reply. I do have the two volumes of TC Smout’s A History of the Scottish People and have been able to obtain relevant information in those fascinating publications. I did not know whether I would publish the piece that I’m presenting but decided to footnote just in case. It is always difficult to do it after the article is written. Thanks for that information, Jennifer, I sure hope Helen sees it.